Starting broccoli for your kitchen garden is one easy way to add some crunch to your salads! Of all the brassicas, or members of the cole family (Cruciferae), delicious, tender broccoli is the easiest to start indoors. But you must start it early, as the heads need time to mature before hot weather arrives. Starting broccoli seedlings | One of the best vegetables to start in your garden is broccoli because of its many health benefits. There are so many benefits to growing broccoli from seed, as it is a cheap alternative to buying it at the store! As you watch your broccoli plants grow it is so fun to watch the plant transform and grow cool crowns in the middle of the plant. To get the most nutrients from the broccoli eat it raw with a little bit of hummus or other yummy dip, or steam it slightly and use this recipe for an amazing ginger flavor! Follow the directions below for an easy to grow start! 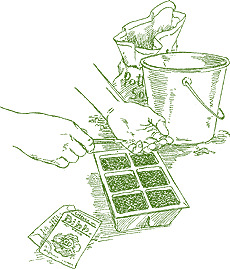 It is most convenient to start broccoli seeds in pots that are large enough to accommodate the plants from sowing right through to transplanting. Use three-inch plastic pots or household items of similar size, such as disposable cups, to give the roots plenty of room to grow. Punch several drainage holes in the bottom of containers that lack them, for seedlings will die if water collects around their roots. If you are reusing old pots, scrub them out and rinse them with a mixture of one part bleach to nine parts water to destroy any lurking disease organisms. these mixes are weed-free and have a light, fluffy texture that encourages quick growth. pour the mix into a bucket and stir in enough water to make it damp but not soggy. fill each pot to within a half inch (1.25 cm) of the top, tapping the pot gently to firm the mix. be sure to label each container with the variety name and sowing date. to speed germination, place the tray in a warm spot such as the top of the refrigerator or television, or near a wood stove. 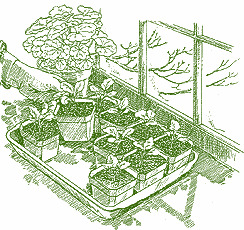 As soon as you spot green leaves arching out of the potting mix (usually within four to eight days), remove the plastic wrap and move the seedlings into bright light. Without adequate light, they will become spindly and weak. You can either make your own light units using standard 48-inch (1.2 m) fixtures, or order one of the ready-to-use units. The tubes should be only an inch or two (2.5 or 5 cm) above the plants’ top leaves. Keep them on for about 14 hours per day. try to keep them relatively cool (60 degrees to 65 degrees F [15.5 to 18 degrees C] during the day, 10 degrees cooler at night). Provide ventilation if the room is too warm, but don’t let cold drafts hit the plants. use a thin stream from a small watering can, or place the pots in a tray and allow water to soak in from the bottom. add a liquid 5-10-5 fertilizer to the water, diluted to half strength, once a week. by the time the plants are about two inches (5 cm) tall, you should have only one plant growing in each pot. A sudden move from cozy indoor quarters to harsh outdoor life can seriously shock young broccoli plants, slowing growth and decreasing the eventual harvest. 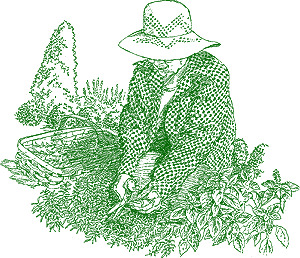 Hardening off forces the seedlings to become tough enough to survive and grow in the cooler temperatures, bright sun, and chill wind of the early-spring garden. expose the seedlings to increasing amounts of sun and cold each day, watering when the soil surface feels dry. By the time you are ready to plant them out, the seedlings—now four to six inches (10 to 15 cm) tall—should be ready for life in the garden.